This article is about the baseball player. For the fictional character on the American television show The Office, see Ryan Howard (The Office). Ryan James Howard (born November 19, 1979) is an American professional baseball first baseman who is a free agent. Howard previously played for the Philadelphia Phillies of Major League Baseball (MLB) from 2004 to 2016. Howard stands 6 feet 4 inches (193 cm) and weighs 240 pounds (110 kg). He bats and throws left-handed. Howard holds numerous MLB and Phillies' franchise records. Howard made his MLB debut in 2004. He won the National League (NL) Rookie of the Year Award in 2005 and the NL Most Valuable Player (MVP) Award in 2006. He is a three-time NL All-Star (2006, 2009, 2010), and has won the Silver Slugger Award, Hank Aaron Award, and the NL Championship Series MVP Award in 2009. Known for his power, Howard is a member of the 50 home run club. He is a two-time NL home run champion (2006, 2008), and became the fastest player to reach both the 100 and 200 home run milestones in MLB history, passing the marks in 2007 and 2009, respectively. Howard was born in St. Louis. He attended Lafayette High School in Wildwood, Missouri, and Missouri State University, where he played college baseball for the Missouri State Bears baseball team from 1998 to 2001. Howard finished his collegiate career with 50 home runs, 183 runs batted in (RBIs), and a .335 career batting average in 172 games played. He was the 1999 Missouri Valley Conference Freshman of the Year. Missouri State retired his number on December 18, 2010. He played one summer in the Central Illinois Collegiate League, a league partially funded by Major League Baseball (MLB) for future prospects to develop. Selected in the 5th round of the 2001 draft, Howard quickly ascended the Phillies' minor league system, earning consecutive awards in the Florida State and Eastern leagues (2003 and 2004), respectively. Howard also set the single-season home run record for the Reading Phillies, with 37 in 102 games. On July 31 he was promoted to Triple-A Scranton/Wilkes-Barre. He became just the fifth minor league player since 1956 to hit at least 46 home runs. Howard won the Joe Bauman Home Run Award in the process. While doing this, he impressed scouts enough that general managers of several teams tried to lure the Phillies' Ed Wade into trading him, as Jim Thome was blocking his path to the majors. On September 1, Howard made his first Major League plate appearance, striking out against Jaret Wright in a pinch-hit at-bat (for Vicente Padilla) in a 7–2 loss to the Atlanta Braves. On September 6, Howard logged his first Major League hit in a single at-bat in a 3–1 loss to the Braves; on September 8, he recorded his first multi-hit game with a double and a single in a 4–1 win over the Braves. On September 11, Howard hit his first Major League home run off Bartolomé Fortunato, driving in his first RBI and scoring his first run in an 11–9 win over the New York Mets. On May 15, Howard recorded his first three-hit game, going 3-for-4 with a double, two singles, and a run-scored in a 4–3 win over the Cincinnati Reds. On July 3, Howard recorded his first three-RBI game against the Atlanta Braves. On August 23, he recorded his first four-hit game, going 4-for-5 with a double, a home run, two singles, three RBI and three runs-scored in a 10–2 win over the San Francisco Giants. On July 1, Howard became the Phillies' everyday first baseman when Thome was sidelined for the season with an elbow injury. Howard was named National League (NL) Rookie of the Month in September. He batted .278 with 10 home runs and 22 runs batted in. In honor of winning the award, he received a specially-designed trophy. Howard led all major league rookies with 22 home runs and posted a .288 average and 63 RBI in just 312 at-bats and 88 games. He hit 11 home runs and 27 RBI in September and October. Howard finished his rookie season with 17 doubles, two triples, 52 runs scored, and 100 strikeouts and 63 runs batted in as the Phillies battled the Houston Astros for the NL wild card until getting eliminated on the last day of the season. Howard was rewarded for his effort by being named NL Rookie of the Year, the fourth Phillie to win the award. He was also voted the Baseball Prospectus Internet Baseball Awards NL Rookie of the Year and received the NLBM Larry Doby Legacy Award (NL Rookie of the Year). After the 2005 season, the Phillies faced a dilemma involving Thome and Howard. Both were very talented and proven power hitters; Thome was the biggest free agent player the Phillies signed prior to the 2003 season, but Howard was the reigning Rookie of the Year and a promising young player. Before the 2006 season, the Phillies traded Thome in order to make room for Howard. An example of Howard's signature stance before taking a pitch. Howard began the 2006 season as the Phillies' starting first baseman. Howard hit his first home run of the season on April 3, off the Cardinals' Chris Carpenter. On April 23, Howard became the first player to hit a home run into Ashburn Alley at Citizens Bank Park. The home run traveled 496 feet (151 m) and was hit off Sergio Mitre of the Florida Marlins. It was the first of two Howard hit in the game, the first multi-home run game of his career. From May 20 to 29, Howard had at least a RBI in nine consecutive games. During that stretch, Howard hit six home runs and drove in 17 runs. He also became the first player to hit a home run into the third deck of the park in right field when he connected off Mike Mussina on June 20, a 437-foot (133 m) long-ball that was again his first of two home runs. To honor the home run, the Phillies painted a white H on the seat where the ball was caught. 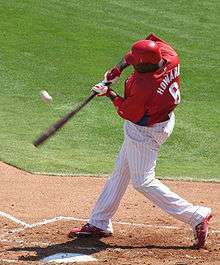 Howard collected seven RBI on the two home runs and a triple in the 9–7 loss, becoming the first Phillies batter to drive in seven runs since pitcher Robert Person on June 2, 2002. Howard was named to his first All-Star game at PNC Park in Pittsburgh as a reserve first baseman, by the player ballot. He participated in the Century 21 Home Run Derby prior to the game, and won the contest with a total of 23 home runs, defeating the New York Mets' third baseman David Wright in the final round. Howard was the second consecutive Phillie to win the Derby, with Bobby Abreu hitting a record 41 home runs in 2005. Howard went 0 for 1 with a groundout in the All Star Game. On July 30, against the Florida Marlins, Howard tied a Major League record by walking five times, including an intentional walk in the eight inning. From August 25 to 29, Howard hit home runs in four consecutive games; on the 29th, Howard hit his 48th home run of the season to tie Mike Schmidt for the Phillies single-season record. On August 31, Howard hit a home run into the upper deck of Robert F. Kennedy Memorial Stadium to surpass Schmidt as the Phillies' single-season home run record holder. On September 3, Howard went 4-for-4 with three home runs and a single in an 8–7 win over the Atlanta Braves, to become the first Philadelphia Phillies batter and the 24th player in Major League history to hit 50 home runs in a season. Howard became the first player to reach 50 home runs in a season since Andruw Jones, who hit 51 home runs the previous year. Reaching 52 home runs in the game, Howard also broke Ralph Kiner's 1947 record for home runs in a sophomore season, becoming just the second batter to hit 50 home runs in a second season. Howard's performance from August 28 to September 3 earned him NL Player of the Week. During that span, Howard batted .571 with six home runs and 12 runs batted in. On September 5, Howard was named the NL Player of the Month for August. His 41 runs batted in were the most any player had in one month since Frank Howard had 41 in July 1962. With 14 home runs, he also set new franchise records for both statistics in the month of August. On September 22, Howard became the 8th player in history to hit 58 home runs in a season, belting a three-run round-tripper off Florida Marlins pitcher Ricky Nolasco. On September 22, Howard became the first hitter to drive in 140 runs since David Ortiz in 2005. On September 27, in a game against the Nationals, Howard walked for the 100th time in the ninth inning. He was also be walked intentionally in the eleventh and thirteenth inning. Howard became the first Phillies' batter to walk 100 or more times since Thome in 2004. Howard finished the 2006 season with a .313 batting average, 58 home runs, and 149 runs batted in. He also set the Phillies' franchise record with 37 intentional walks. Howard and Ortiz were the only hitters to hit 50 or more home runs that season. Howard's 58 home runs was the most by a player in his sophomore season. In the process, Howard became the first Phillies' batter to win the home run title since Jim Thome did it in 2003. On October 10, Howard was named The Sporting News 2006 Player of the Year. On October 25, Howard was awarded the 2006 NL Hank Aaron Award. On November 20, he won the National League MVP award, and became one of three players in baseball history to win the Rookie of the Year and MVP awards in consecutive seasons, joining Cal Ripken, Jr and later joined by Dustin Pedroia in the 2008 season. Howard received the Babe Ruth Home Run Award for leading MLB in home runs. He also received the Pride of Philadelphia Award from the Philadelphia Sports Hall of Fame. He also received the NLBM Oscar Charleston Legacy Award (NL MVP) and the NLBM Josh Gibson Legacy Award (NL home-run leader). The Philadelphia Baseball Writers' Association of America awarded him the third annual Mike Schmidt Most Valuable Player honor. On March 2, 2007, the Phillies renewed Howard's contract in a one-year deal for $900,000, the highest salary ever offered to a player not eligible for salary arbitration. On June 27, Howard hit a 461-foot (141 m) home run, and became the fastest player in Major League Baseball history to hit 100 home runs. The accomplishment was achieved in only 325 games, 60 games fewer than the 385 games that Ralph Kiner needed to hit his first 100 home runs from 1946 to 1948. After coming back from the DL, Howard had a "power surge", as he quickly climbed to second on the home run leaders list in the National League. On July 25, Howard hit a walk-off home run in the bottom of the 14th inning to give the Phillies a victory over the Washington Nationals. Howard had his first career stolen base on August 21, 2007 vs. the Los Angeles Dodgers. On September 17, Howard hit 2 home runs, which gave him his 39th and 40th home run of the season. On February 21, 2008, Howard won an arbitration case against the Phillies, and was awarded $10 million, the most ever for a victorious player and tied for the most ever awarded. The Phillies had offered $7 million to Howard in salary. Howard began the 2008 season in a slump, finishing the month of April with a batting average of just .172 and going 2-for-25 to close out the month. He fared better in May, averaging .238 with ten home runs and 30 RBI for the month, and finishing out May just north of the Mendoza Line with an overall batting average of .205. Howard hit his 15th home run of the season in a 7–3 loss to the Florida Marlins on May 30, and teammate Chase Utley hit his 15th homer on May 25. The two became the first pair of Phillies to hit 15 home runs each before June. On June 13, Howard hit two home runs and had 5 RBIs in a 20–2 win over the St. Louis Cardinals. This included the second of a first-inning set of back-to-back-to-back Philadelphia home runs. It was the seventh time that the Phillies had hit three consecutive home runs, the first since May 18, 2004, and the fourth occurrence by any team in the 2008 Major League Baseball season. On June 16, Howard again hit two home runs and drove in four in an 8–2 win over the Boston Red Sox for his 15th career multi-homer game; the four-day span between multi-homer games was the shortest of his career. In stark contrast, Howard went 0-for-4 the next night with four strike outs in a 3–0 loss for his tenth career golden sombrero. Howard drove in his 100th run of the 2008 season on August 1 against the Los Angeles Dodgers, marking his third consecutive season with at least 100 RBI. He finished the season with 146 RBIs and a .251 batting average. His contributions again helped lead the Phillies to the division title and the post-season. Against Milwaukee in the first round he batted a mere .182 average and only batted in one run. Things picked up as he delivered with a .300 batting average against the Dodgers in the next round although he only delivered 2 RBIs and still remained in his home run drought in the post-season. However, as the Phillies advanced to the World Series he finally started delivering significantly with 6 RBIs, .286 batting average, and 3 home runs (which tied Donn Clendenon's 1969 World Series record for most home runs in a five-game Series) – two of which came in game 4 (which also drove in 5 RBIs) as the Phillies took a commanding 3–1 series lead. The Phillies eventually won the series in 5 games to bring the Phillies their first World Series championship since 1980, and Philadelphia their first major sports championship since 1983; he finished second in the voting for the 2008 NL MVP award, behind Albert Pujols of the St. Louis Cardinals. Howard won his second Babe Ruth Home Run Award and his second Josh Gibson Legacy Award, leading MLB with 48 home runs. 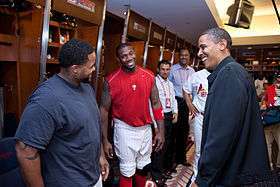 Barack Obama talks with Howard and Prince Fielder (left), before the start of the MLB All-Star Game. On May 4, Howard hit his second grand slam of the year, the seventh in his career, against the St. Louis Cardinals at Busch Stadium. On May 30, he hit his third grand slam of the season off of Washington Nationals pitcher Shairon Martis. The grand slam landed in the third deck in the first row above the Powerade sign in right field at Citizens Bank Park, and was estimated at 475 feet (145 m). The grand slam put Howard ahead of Mike Schmidt, who had 7 grand slams in his career, putting him first all-time in Phillies franchise history. Howard was named to the 2009 All Star team and also competed in the Home Run Derby. In August, Howard hit 11 home runs with 33 runs batted in, after just six the month before. On August 24, in a game against the New York Mets, Howard went 2 for 5 with 2 home runs and 5 runs batted in. Howard also recorded his 100th runs batted in of the season. This marked the fourth consecutive season that Howard had reached the 100 runs batted in mark. His batting average in the month was .299, raising his overall average to .275. He was named the NL Player of the Month for these achievements. Howard was named NL Player of the Week on August 31. Howard hit 5 home runs, 12 runs batted in, 28 total bases, and a 1,000 slugging percentage during that stretch. On September 18, in a game against the Braves, Howard hit his 39th and 40th home run of the season. This mark the fourth time in his career that he has hit 40 or more home runs in a season. On October 3, Howard hit his 45th home run of the season and became only the fourth player in Major League Baseball history (joining Babe Ruth from 1926–1931, Ken Griffey Jr. from 1996–1999, and Sammy Sosa from 1998–2001) to amass at least 135 RBIs and 45 home runs in four consecutive seasons. Howard ended the season tied with Milwaukee Brewers first baseman Prince Fielder for the major league lead in RBIs with 141. 2009 National League Division Series (NLDS) against the Colorado Rockies, Howard hit a game-tying double with two outs in the top of the ninth off of closer Huston Street. Howard scored the winning run on a Jayson Werth single. After tying Lou Gehrig's record for the most consecutive postseason games with an RBI, Howard won the NLCS MVP award on October 21. However, Howard struggled against the New York Yankees during the 2009 World Series, surpassing Willie Wilson's record by striking out 13 times in the series. Howard injured his ankle on August 1, 2010. On April 26, 2010, Howard signed a 5-year, $125 million extension with a club option to the contract he inked before the 2009 season. He was also the first designated hitter in a NL ballpark during a regular-season game when the Phillies played as the road team against the Toronto Blue Jays in Citizens Bank Park on June 25. Major League Baseball moved the interleague series to Philadelphia due to the G-20 Summit taking place near the Rogers Centre in Toronto. On August 1, Howard sprained his ankle while returning to second base on a baserunning play, and was placed on the 15-day disabled list. On August 24, he was ejected in the 14th inning by 3rd base umpire Scott Barry for arguing a check swing strikeout. With no position players left the Phillies had to use a pitcher to replace Howard. On September 8, Howard hit his 250th home run in only 855 games, which made him pass Ralph Kiner as the quickest player in history to reach that milestone. On September 18, Howard hit his 30th homer of the season, setting a franchise record with five consecutive 30-homer, 100-RBI seasons. He had been tied with Chuck Klein, who had four consecutive 30-homer, 100-RBI seasons from 1929 to 1932. On defense, he led all major league first basemen in errors for the third year in a row, with 14. Howard was listed with teammates Chase Utley, Jamie Moyer, and Roy Halladay as one of the few active players that is likely to be considered for the Hall of Fame. Through 2011, Howard was fourth among all active major leaguers in career slugging percentage (.560; behind Albert Pujols, Alex Rodriguez, and Ryan Braun), and ninth in career intentional walks. During the 2011 season, Howard had a batting average of .253, 33 home runs and 116 RBIs. It was his sixth consecutive 30 home run and 100 RBI season, a Phillies franchise record. In Game 5 of the 2011 NLDS vs the St. Louis Cardinals, Howard was the last batter to ground out before the Phillies lost the series. Howard tore his Achilles tendon when running to first base on the final play of the game, a ground out to the second baseman, Nick Punto. His injury required surgery and as a result, he missed the start of the 2012 season. Howard began the 2012 season on the 15-Day DL. He said in a podcast in early June that his Achilles tendon injury is "progressing at a positive pace". On July 6, 2012, he was activated for his first game of the 2012 season, in which he went 2-for-4 with a double in a 5-0 Phillies loss. Howard hit his 300th career home run on September 22; his season ended one week later on September 29 after suffering a small fracture in his big right toe. He finished the 2012 season with a .219 batting average, 14 home runs, and 56 RBI in 71 games. On July 8, 2013, Howard went on the disabled list, missing 6–8 weeks with a torn left meniscus. He underwent arthroscopic surgery to repair the tear and did not play for the remainder of the season. He was hitting .266, had 11 home runs, and 43 RBIs at the time of his injury. Howard entered the 2014 season feeling rejuvenated, and looking to utilize the whole field, rather than exclusively pull the ball, as he had done in recent years. After reaching base in his first three at bats on opening day, Howard batted in the fifth position in the Phillies' second game during which they faced a left-handed pitcher; it ended a streak of 665 starts for Howard in which he batted in the fourth position. On May 31, Howard hit a three-run home run for the 1,000th RBI of his career in an eventual loss to the New York Mets. Howard became the fastest player in MLB history to 1,000 RBIs, accomplishing the feat in only 1,230 games. In 153 games of the 2014 year, Howard struck out an MLB-leading 190 times while batting .223 with 23 home runs and 95 RBI. In 2015, Howard batted merely .229, and his 23 HR, 77 RBIs and 138 strikeouts led the last-placed Phillies, even though he missed the last three weeks of the season due to a left knee injury. Howard began the 2016 season with a protracted slump; by late May, with his batting average at .161 after 39 games and with the arrival of a young promising first baseman in Tommy Joseph, baseball pundits assert that the Phillies should consider simply releasing Howard and let the 36-year-old retire. On June 1, manager Pete Mackanin announced his plans to keep Howard on the bench so as to give Joseph, a rookie, more playing time at first base. Howard hit his 375th home run on August 16, 2016 versus the Dodgers. In 112 games of 2016, Howard finished with a .196 batting average, 25 home runs, and 59 RBI. On November 2, the Phillies declined the option for Howard that had a $23 million dollar deal for the upcoming season, making him a free agent for the first time of his career. Howard has a fraternal twin brother named Corey, as well as an older brother and a sister. He says he is the smallest of the Howard sons. His favorite baseball team growing up was the St. Louis Cardinals. Howard has a son named Darian Alexander, who was born January 26, 2001. Howard graduated from Lafayette High School (Wildwood, St. Louis County, Mo.) in 1998, where he played trombone. While attending Missouri State University he became a member of Phi Beta Sigma fraternity and his line name was "Blue Hurt". Howard is a representative for a number of products including Under Armour and the Subway restaurant chain. He also appeared on the cover of MLB 08: The Show. Howard appeared alongside teammate Chase Utley as himself on the 2010 episode of It's Always Sunny in Philadelphia "The Gang Gets Stranded in the Woods". He also appeared as himself during the 7th season of Entourage in the episode "Lose Yourself" and appeared in the final season of The Office; set in Scranton and created during his time in Triple-A there, Howard is the acknowledged namesake of one of the show's main characters, who in one episode claimed to be "Ryan Howard, the baseball player" in an attempt to gain entry into a New York nightclub. Howard married former Philadelphia Eagles cheerleader Krystle Campbell in Maui on December 1, 2012. A longstanding lawsuit between Howard and his family over finances was settled in November 2014. On January 5, 2016, it was announced that Howard had filed a lawsuit suing Al Jazeera for defamation following the publication's release of the documentary "The Dark Side: Secrets of the Sports Dopers", which linked Howard and Washington Nationals infielder Ryan Zimmerman, among others, to a clinic that allegedly distributed steroids and HGH. Zimmerman also filed suit against Al Jazeera for defamation. ↑ "Ryan Howard Returns to Campus Saturday for Jersey Retirement Ceremony". December 15, 2010. Archived from the original on July 27, 2011. Retrieved March 2, 2014. ↑ "Big Phils World Series run started in Reading 10 seasons ago". Official site of the Double-A affiliate of the Philadelphia Phillies. October 16, 2008. Archived from the original on April 20, 2009. Retrieved July 17, 2009. 1 2 3 4 "Howard named Eastern League MVP". MLB.com. September 30, 2004. Archived from the original on April 20, 2009. Retrieved September 11, 2009. ↑ "Phillies' Ryan Howard Round-Tripper Contest Winner – OurSports Central – Independent and Minor League Sports News". OurSports Central. September 17, 2004. Retrieved September 14, 2011. 1 2 3 "Street wins AL Rookie of Year; Howard wins NL". ESPN.com. Associated Press. November 5, 2005. Archived from the original on February 9, 2006. Retrieved July 17, 2009. ↑ "Howard voted National League Rookie of the Month". MLB.com. October 3, 2012. Archived from the original on November 10, 2012. Retrieved May 18, 2013. ↑ "Ryan Howard Career Home Runs". Baseball-Reference.com. Retrieved December 23, 2015. ↑ "Howard makes a memory". MLB.com. Retrieved March 8, 2007. 1 2 Baer, Bill (2012). 100 Things Phillies Fans Should Know & Do Before They Die. United States: Triumph Books. p. 256. ISBN 9781617496189. ↑ Antonen, Mel (August 30, 2006). "Power surge: Slew of sluggers taking aim at 50". USA Today. Retrieved March 3, 2010. ↑ "Howard breaks Phillies' single-season HR record in loss". ESPN.com. Associated Press. August 31, 2006. Archived from the original on January 11, 2012. Retrieved March 3, 2010. ↑ At the following webpage, scroll down to "The Babe Ruth Homerun Award". "06 Fan Stories: Ultimate Babe Ruth Fans". Babe Ruth Central. Archived from the original on November 8, 2011. ↑ "Howard receives honor Lefty slugger earns Mike Schmidt Player of the Year Award". phillies.com. Retrieved March 8, 2007. ↑ Zolecki, Todd (March 3, 2007). "The $900,000 Man". Philadelphia Inquirer. Philadelphia Media Network. Archived from the original on March 5, 2007. Retrieved March 8, 2007. ↑ "HitTracker :: Player and Field Detail". Hittrackeronline.com. June 3, 2011. Archived from the original on December 25, 2007. Retrieved September 24, 2011. ↑ "Reds beat Phillies to end three-game losing streak". ESPN.com. Associated Press. June 27, 2007. Archived from the original on March 28, 2014. Retrieved September 18, 2009. ↑ Jasner, Andy (September 27, 2007). "Howard sets single-season whiff mark". MLB.com. Archived from the original on July 16, 2011. Retrieved September 11, 2009. ↑ "Major League Leaderboards » 2007 » Batters » Advanced Statistics". Fangraphs.com. Archived from the original on May 3, 2007. Retrieved September 24, 2011. ↑ Rob Maaddi (April 21, 2011). "Ryan Howard beats Phillies in arbitration and will earn $10 million". USA Today. Archived from the original on April 20, 2014. Retrieved April 20, 2014. ↑ "Utley and Howard Power the Phils". ESPN.com. Archived from the original on November 7, 2012. Retrieved September 24, 2011. ↑ "Phillies hit three straight homers in first inning". CBS News. June 13, 2008. Archived from the original on June 16, 2012. Retrieved September 24, 2011. ↑ Mark Bowman. "Braves veterans reign in blowout win". Mlb.mlb.com. Archived from the original on June 16, 2011. Retrieved September 24, 2011. ↑ Jim Molony. "Astros use long ball to down Brewers". MLB.com. Archived from the original on July 14, 2011. Retrieved September 24, 2011. ↑ Bill Chastain (April 18, 2000). "Rays go back-to-back-to-back vs. Angels". MLB.com. Archived from the original on June 6, 2011. Retrieved September 24, 2011. ↑ Mandel, Ken (August 12, 2008). "Howard reaches 100-RBI mark again". Philadelphia Phillies. Archived from the original on April 21, 2014. Retrieved August 12, 2008. ↑ "Ryan Howard Stats, Bio, Photos, Highlights | phillies.com: Team". MLB.com. Retrieved September 24, 2011. ↑ Leach, Matthew (November 17, 2008). "Crowning achievement: Pujols NL MVP". Major League Baseball. Archived from the original on June 29, 2011. Retrieved November 17, 2008. ↑ "This Week at Citizens Bank Park (August 28 – September 3)" (Press release). Philadelphia Phillies. August 27, 2009. Archived from the original on November 8, 2011. ↑ "Yearly League Leaders & Records for Home Runs". Baseball-Reference.com. Archived from the original on July 24, 2011. Retrieved November 9, 2011. ↑ Zolecki, Todd (February 8, 2009). "Howard agrees to $54 million contract". Philadelphia Phillies. Archived from the original on June 1, 2009. Retrieved February 8, 2009. ↑ "Major League Baseball Stats — Sortable Statistics". Major League Baseball. Retrieved July 17, 2009. ↑ Jasner, Andy (May 30, 2009). "Howard's blasts help Phils outslug Nats". MLB.com (Press release). Archived from the original on June 1, 2009. Retrieved July 17, 2009. ↑ Zolecki, Todd (July 13, 2009). "Howard enjoys hometown HR Derby". MLB.com (Press release). Retrieved August 18, 2015. ↑ Andy Jasner. "Howard overcomes flu to hit big homer". Mlb.mlb.com. Archived from the original on October 23, 2013. Retrieved September 24, 2011. 1 2 Gonzalez, Alden (July 16, 2009). "Howard fastest in history to 200 homers". MLB.com (Press release). Archived from the original on July 20, 2009. Retrieved July 17, 2009. ↑ "Ken Griffey Statistics and History". Baseball-Reference.com. Archived from the original on August 8, 2011. Retrieved April 15, 2010. ↑ "Phillies fall, but clinch home-field advantage for NLDS". ESPN.com. Associated Press. October 3, 2009. Archived from the original on October 7, 2009. Retrieved March 3, 2010. ↑ "Howard's big bat earns him MVP honors in NLCS". Bleacher Report. Associated Press. October 21, 2009. Archived from the original on April 21, 2014. Retrieved March 3, 2010. ↑ Bowman, Mark (November 5, 2009). "Howard deals with World Series struggles". MLB.com. Archived from the original on November 3, 2012. Retrieved March 3, 2010. ↑ "Howard signs five-year extension". ESPN.com. April 27, 2010. Archived from the original on April 28, 2010. Retrieved April 20, 2014. ↑ Zolecki, Todd; Schonbrun, Zach (June 26, 2010). "Howard is first DH at Citizens Bank Park". Phillies.MLB.com (Press release). Archived from the original on June 28, 2010. Retrieved June 29, 2010. ↑ "Howard placed on disabled list". MLB.com (Press release). August 3, 2010. Archived from the original on October 12, 2012. Retrieved August 5, 2010. ↑ "Ryan Howard". MLB.com (Press release). ↑ Todd Zolecki (September 18, 2010). "Howard sets Phils mark with 30th homer". MLB.com. Archived from the original on December 12, 2013. ↑ Doug Miller (January 6, 2010). "A look at active players' Hall credentials". MLB.com. Archived from the original on January 8, 2010. ↑ "Ryan Howard Statistics and History". Baseball-Reference.com. Archived from the original on October 9, 2011. Retrieved October 5, 2011. ↑ Gelb, Matt (July 8, 2013). "Phillies first baseman Ryan Howard out 6-8 weeks with torn meniscus". The Inquirer. Archived from the original on July 10, 2013. Retrieved July 9, 2013. ↑ Deitch, Dennis (February 15, 2014). "Philadelphia Phillies first baseman Ryan Howard has eyes towards playing full season". The Times Herald. Norristown, Pennsylvania. Archived from the original on April 7, 2014. Retrieved April 2, 2014. ↑ Lawrence, Ryan (April 1, 2014). "Phillies' bats come alive in time". High Cheese/Philadelphia Daily News. Philadelphia Media Network. Archived from the original on April 20, 2014. Retrieved April 2, 2014. ↑ Zolecki, Todd (April 1, 2014). "Howard's streak of hitting cleanup comes to an end". phillies.com. MLB Advanced Media. Archived from the original on April 7, 2014. Retrieved April 2, 2014. ↑ Bill Baer (May 31, 2014). "Ryan Howard becomes the fastest to 1,000 career RBI". NBC Sports. Archived from the original on June 2, 2014. Retrieved June 1, 2014. ↑ Matt Lombardo (November 12, 2014). "MLB hot stove: Kansas City Royals interest in Ryan Howard reportedly overblown". NJ.com. NJ Advance Media. Retrieved November 30, 2014. ↑ Veasey, Matt. "Phillies 2015 Report Card: Infielders". thatballsouttahere.com. FanSided inc. Retrieved 28 May 2016. ↑ Baer, Bill (May 23, 2016). "Is it time for the Phillies to release Ryan Howard?". NBC Sports. Retrieved May 24, 2016. ↑ Schoenfield, David (May 24, 2016). "It's time for the Phillies to release Ryan Howard". ESPN. Retrieved May 24, 2016. ↑ Stark, Jayson (June 2, 2016). "Phillies to start Tommy Joseph in place of Ryan Howard for 3-4 days". ESPN. Retrieved 2 June 2016. ↑ "Phillies decline options on Ryan Howard, Charlie Morton". FOX Sports. Retrieved November 2, 2016. ↑ "Phillies' Howard reaches settlement with family". ESPN.com. Associated Press. November 19, 2014. Archived from the original on November 29, 2014. Retrieved November 20, 2014. ↑ Huber, Robert (April 2007). "Ryan Howard Is Not a Creep, a Cheat, a Liar or a Fraud". Philadelphia Magazine. Archived from the original on June 3, 2009. Retrieved November 5, 2009. ↑ Jim Salisbury (February 24, 2012). "Howard signs new deal with Under Armour". CSN Philly. Retrieved November 21, 2012. ↑ "MLB 08: The Show". PlayStation. Retrieved August 25, 2008. ↑ Archibald, Monty (December 5, 2012). "Baseball star Ryan Howard's cheerleader wife trashes her wedding dress during beach photo shoot". Daily Mail. Mail Online. Retrieved November 20, 2014. ↑ Gross, Dan (December 4, 2012). "Dan Gross: Ryan Howard weds in Hawaii". Philadelphia Inquirer. Archived from the original on November 30, 2014. Retrieved November 20, 2014. ↑ Matt Snyder (November 19, 2014). "Ryan Howard recently finished legal battle with family over money". CBS Sports. Archived from the original on November 19, 2014. Retrieved November 26, 2014. ↑ Bowman, Mark (October 19, 2009). "Howard's RBI streak sets playoff mark". MLB.com. MLB.com. Archived from the original on October 23, 2009. Retrieved October 20, 2009. ↑ "Howard ties Gehrig's RBI streak". ESPN.com. Associated Press. October 19, 2009. Archived from the original on October 23, 2009. Retrieved October 20, 2009. ↑ "Ryan Howard fastest to 250 HR all-time". ESPN.com. September 8, 2010. Archived from the original on September 11, 2010. Retrieved September 24, 2011. ↑ Howard's Golden Sombreros Philly.com April 14, 2015 http://articles.philly.com/2015-04-14/sports/61108280_1_mets-san-diego-chicago-cubs Accessed May 28, 2015. 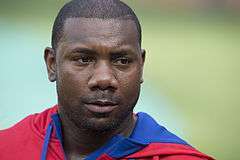 Wikimedia Commons has media related to Ryan Howard.